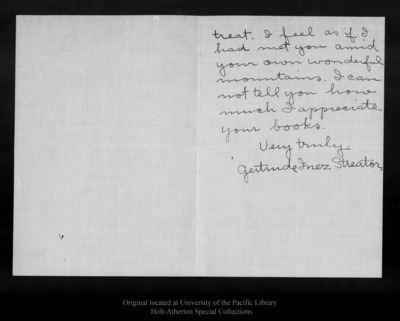 Letter from Gertrude Inez Streator to John Muir, 1913 Mar 25.
treat. I feel as if I had met you amid your own wonderful mountains. I can not tell you how much I appreciate your books.Very truly.Gertrude Inez Streator. Original letter dimensions: 15 x 21 cm.